For American kids, it's Curious George or The Cat In The Hat. For English kids it's Peter Rabbit. But for Australian kids the most beloved mischief-maker in children's literature is a koala named Blinky Bill. A new exhibit at Australia's Monash University Library highlights the boy-like bear (okay, koala's aren't really bears but you get the picture) along with other childhood literary favorites from Down Under. The books on show, from March through June 2010, were all gifts from a lifelong collector of children's literature, former Secretary of the Monash University Faculty of Education, Lindsay Shaw. And now the whole world has a chance to enjoy this treasure trove of English, American, and Australian books and games, as the Library has created a virtual exhibition consisting of over 100 images from this extensive collection. For those unfamiliar with kiddie lit from Oceania, it offers an introduction to the adventures of one of its most appealing characters, Blinky Bill. The koala is a natural to become a hero of children's stories. Aside from it's obvious cute and cuddly charms, this marsupial's gentle behavior and human-like characteristics make it easy to anthropomorphize. Koalas feed exclusively on the leaves of the eucalyptus tree, and their slow metabolic rate causes them to rest or sleep 16 to 18 hours a day. Can you imagine a more peaceable creature? And these furry critters are virtually silent: males vocalize in mating season, but otherwise the species emits a cry like that of a human baby only when severely stressed. They are also one of the few mammals, other than primates, with opposable thumbs and fingerprints. Full grown male koalas weigh roughly 25 pounds, with females being about half that, making them no bigger than a one-year-old child. They live exclusively in Australia, and not surprisingly have become a national symbol of the continent. The woman who made a koala the most celebrated picture book hero in Australia, Dorothy Wall, ironically was born in New Zealand in 1894. As early as age 10 she showed a natural talent for drawing, and later won scholarships to both the Canterbury College School of Art and the Wellington College of Design. She earned a living as a fashion illustrator and book jacket designer before moving to Sydney in 1914 to work for The Sun newspaper. By 1920 her illustrations had been featured in a popular magazine of the day, The Lone Hand, and her first children's story, Tommy Bear And The Zookies, was published that same year. Most of her income came from illustrating the works of other children's authors, and she became recognized for her ability to create fanciful fairies and realistic animals with equal skill. In the mid-1930's Australian authors began more and more to write stories featuring their nation's unique flora and fauna. Dorothy Wall was part of the trend towards celebrating the native beauty of her adopted home in children's books. She created illustrations for Jacko The Broadcasting Kookaburra in 1933, and for The Amazing Adventures of Billy Penguin in 1934. At this same time she published her first book featuring the character who would become an Australian cultural icon, Blinky Bill: The Quaint Little Australian. Blinky Bill is a combination of a koala bear and a naughty little boy. His adventures involve other creatures native to Australia, including wombats, platypuses, kangaroos, rabbits, and frogs. They also include themes advocating forest conservation, and strong condemnation of the common practice of hunting koalas and other animals for their fur. The Hunted Becomes The Hunter, But At Least It's Only A Game. 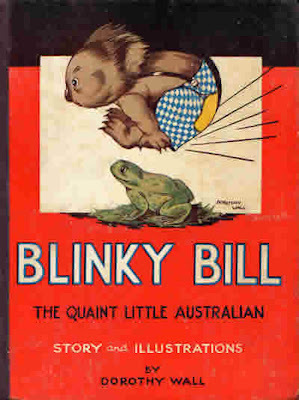 Blinky Bill's popularity was immediate, and two sequels soon followed, Blinky Bill Grows Up in 1934, and Blinky Bill and Nutsy: Two Little Australians in 1937. 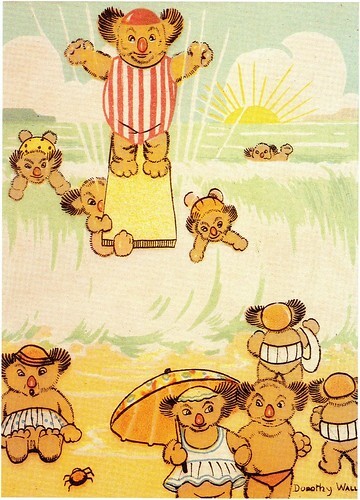 Unfortunately the popular appeal of the mischievous yet lovable koala led to pirating of the character as far away as the United States, and, like many authors, Dorothy Wall never earned a penny from most of the toys, dishes, games, and unauthorized books adorned with her appealing illustrations. Eventually she became depressed at having to illustrate the work of other writers just to make money. After a divorce, she and her only child, a son named Peter, returned to New Zealand. Here she once again became a newspaper illustrator, this time for the New Zealand Herald and Auckland Weekly News. 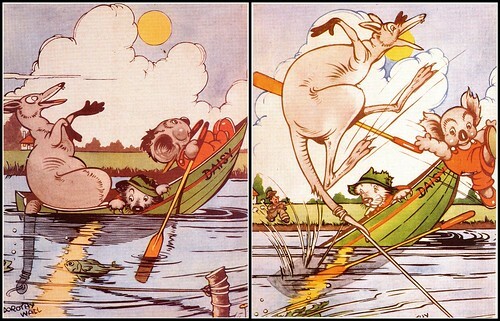 This Blinky Bill pop-up, “Magic-action" book, is an American piracy, published without Dorothy Wall's permission, and containing no mention of the author's name.Wall, Dorothy, 1894-1942. 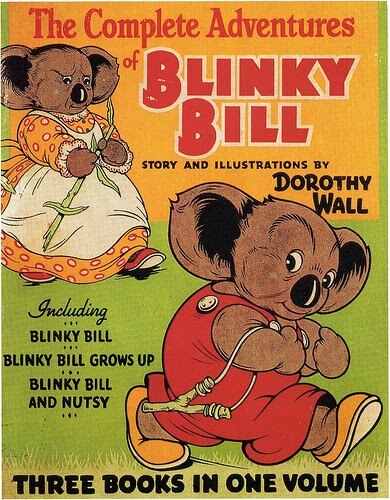 Blinky Bill / [Dorothy Wall]. Back in the country of her birth, Dorothy Wall continued to write stories set in Australia. Her publisher frequently hired her for illustrating work on books by other authors to help her make ends meet. At one point she told him she was forced to make simply earning a living her primary focus, giving up on "the honor and glory of seeing [her] name in print." In 1940 one last Blinky Bill book was published, Blinky Bill Joins The Army. It was written as a patriotic gesture to benefit the war effort, and was initially rejected by her longtime publisher as outright propaganda. A complete rewrite was demanded for the once popular author to get the book published at all. Seeing her new work in print revived both Dorothy Wall and her career, and in 1941 she returned to Sydney telling her publisher: "I'll have to start the battle all over again but feel much better and more able to combat disappointment." Sadly her health did not hold out, and she died of pneumonia less than a year later. Dead at the young age of 48, she left behind her son and the enduringly popular character she created. One Of Many Titles Published After Dorothy Wall's Death. 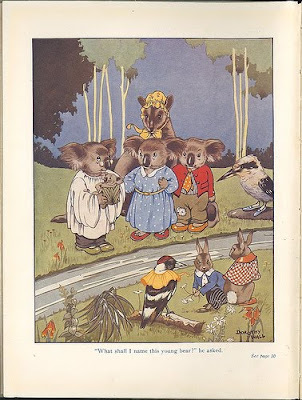 A compilation of the first three books starring the enchanting koala, The Complete Adventures Of Blinky Bill, was first published in 1939 and reprinted 15 times between 1940 and 1965. Blinky Bill remained a fixture in the Australian Sunday newspaper comics for decades, and was the star of a feature film in 1992, and of three animated television series in 1993, 1995, and 2005. All of Blinky Bill's celluloid adventures stressed the importance of maintaining the endangered forest habitat of the koala, and of preventing the extinction of animal species worldwide. (Koalas had been hunted nearly to extinction in the early 20th century, and are still considered endangered today.) In 2010 Blinky Bill remains one of the most recognizable literary characters in Australia, and has his own Facebook page and YouTube videos. And early editions of the Blinky Bill books are now highly sought after, and find themselves right at home in the Rare Book Collection of the Monash University Library. So much more interesting than a purple dinosaur.